The 1989 unsolved homicide of Angel Hazelton. 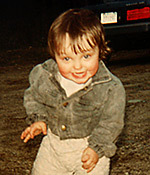 On April 12, 1989 Angel Hazelton was 21 months old when Angel's mother, Angela Lane and Angela's boyfriend, Wayne Kimball, called an ambulance because Angel was suffering seizures. Angel was initially taken to Lakes Region General Hospital in Laconia, NH and later transported to Boston Children's Hospital where she died on April 15, 1989. An autopsy revealed that Angel died as a result of blunt force trauma to the head. The autopsy indicated that the injuries were up to one week old. At the time of her death, Angel was living with her mother and Kimball on Stagecoach Road in Meredith, NH. Angel also spent time with her father, David Hazelton, who lived on Oxbow Road, in New Hampton, NH at the time.